Don't think of it as the Tate Modern, think of it as Tony Hart's gallery on TV. Tony Hart seemed like a very nice man with a genuine love of children's art. History will vindicate him. Some of these pictures are animated, some are not, but all are moving in their own way. This picture is all about love. It has a bear "falling in love", but with whom? Do we fall in love with other people? With ourselves? Or do we fall for the transforming power of love itself? I really don't know. This picture is rather cruel. When we get bored of picking our own scabs, we resort to picking other people's instead. It may well be true that every accusation is an autobiography, but some are better written than others. Another bear. This one is singing a Queen song. In my weak moments I find myself humming along. Whatever you say about the songs of Queen, they are pretty catchy. A man is hit on the head by Golf. Not a gold club, but golf itself. Golf machines are increasingly popular in pubs, usually with young, suited men. It is a worrying trend. 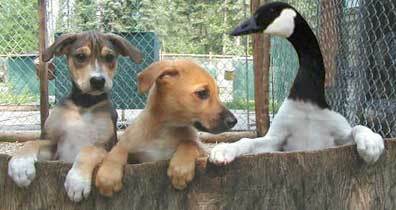 Sometimes I feel like a duck/dog hybrid. Nasty things, all bill and paws and a nasty sinking feeling. A still from 2001: A Space Odyssey. 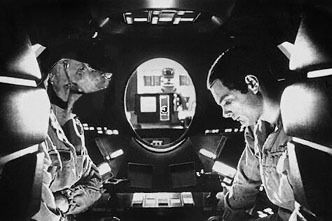 This is the scene where astronaut Dave Bowman is talking to Fido about Hal's deteriorating mental health.